The human brain is absolutely fascinating: It has some 100 billion nerve cells that are constantly communicating with one another, and the nerve pathways in an adult’s brain stretch to a length of 5.8 million kilometers. Our neural networks provide the basis for how we feel, think, and perceive our environment. Every brain is different, and every brain changes continually. Some of these differences can be visualized by means of a simple brain scan using magnetic resonance imaging (MRI) equipment, which can be found at any modern hospital. Neuroscientist Simon B. Eickhoff of Research Center Jülich wants to find out how these structural changes are linked to a person’s behavior and cognitive characteristics. Eickhoff and his team use two tools to pursue this goal: extremely large volumes of data paired with self-learning software from the field of artificial intelligence. The software is supplied with MRI images from brain scans and data relating to individuals, including their age, gender, and any diseases. By learning from this data, the software can make predictions about other individuals, even if it only has access to their brain scans. “Brain scans let us pinpoint changes in the functional networks of the brain, so we can make objective statements about a person’s individual characteristics,” says Eickhoff, who presented his research at last year’s Helmholtz Horizons Symposium, The Digital (R)evolution in Science. Or, to put it more plainly: Show me your brain, and I’ll tell you who you are. This means that traditional tests and questionnaires like those used to diagnose dementia and depression, for example—or by assessment centers in the job application process—could be supplemented or replaced by processed image files in the future. And this principle works. For example, Eickhoff’s research team succeeded in determining the age of test subjects based only on MRI scans and the self-learning software—though there was still a margin of error of four to five years. 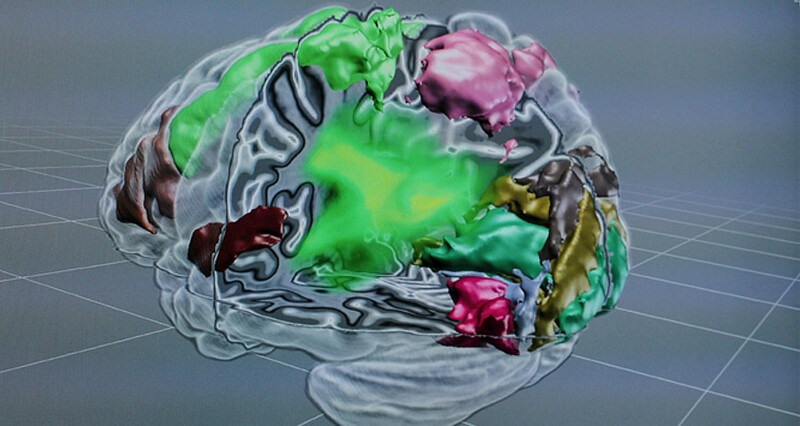 During another research project, the team at Jülich used the scans to compare the brains of individuals suffering from Parkinson’s disease with those of healthy control subjects. Their results showed that, on average, the brain of a Parkinson’s patient is five to six years “older” than the subject actually is. “This is a very interesting way to objectively quantify the progress of neurodegenerative diseases like Alzheimer’s or Parkinson’s,” says Eickhoff. In addition, the researchers from Jülich and the University of Düsseldorf demonstrated that characteristics such as memory capacity and individual personality traits, or at least tendencies toward them, can be predicted from MRI images. But evaluating brain scans could also offer benefits in clinical practice when it comes to early diagnosis and prognosis. For example, the neuroscientists are working to predict postnatal depression in young mothers based on brain scans. This relatively frequent disorder affects five to ten percent of mothers and currently can only be detected when symptoms occur. “The period shortly after giving birth is a very vulnerable time for the brain; there are many hormonal changes. And there is a high risk of postpartum depression,” Eickhoff says. According to the researcher, his goal is to investigate whether clinical data and brain scans can be used to predict the likelihood of depression developing later on. However, as Eickhoff also clearly stresses, the research isn’t ready to be used in clinical applications yet. But he says it’s only a matter of time, provided that this field continues to develop at the current rapid pace. As Eickhoff says, “It’s not a matter of decades anymore, but rather less.” Apart from that, he emphasizes another aspect that has to be addressed first: What is to be done with the datasets from subjects’ brain scans, when these might provide information we cannot even imagine yet using more sophisticated technology in the future? “This presents ethical and legal problems,” Eickhoff says. And he notes that appropriate solutions still need to be identified in this area.